All of our sixteen residents access day support, employment or education opportunities throughout the community, so mornings are spent getting up, getting ready and setting off for the days activities. However Montagu is able to support clients in the community at home, who may be too young for school, here’s a story of our daytime activities. At the end of 2010, Montagu was presented with the opportunity to ‘return to our roots’ so to speak by working with a young child. At the start of 2011, June, one of our long term support workers, commenced working with three year old Jack and his family after they were successful in gaining an individual support package of four hours a week. Jack, the youngest of five children, has epilepsy, cerebral palsy, intellectual disability, a sensory disorder, hydrocephaly and is currently undergoing diagnosis for Autism. June works with Jack each Monday, arriving at Jack’s home outside of Hobart at 10.30am. The day starts with Jack’s Mum and Dad chatting to June about how Jack has been since last week, gathering the supplies needed for the day and heading off in the car. Jack enjoys the short drive into the nearby town, sometimes taking a nap. The local school have been fantastic support and Montagu, the school and Early Childhood Intervention Services have been able to collaborate for Jack’s support. The school have offered June and Jack a room with specialised equipment to use. In addition, Jack and June have also been able to access on occasion the Early Childhood Intervention Services campus and their facilities. It is once they are settled at the venue for the day, that the work begins! June supports Jack with an individualised program designed by a teacher at Early Childhood Intervention Services to work on a range of developmental areas. Jack has a significant sensory disorder that is particularly evident with his sense of touch and taste. Jack presently cannot tolerate the taste or texture of any solid food nor does he easily tolerate the feel of water or other textures and materials. Jack’s program therefore has a strong focus on desensitisation so that he can participate more in the world around him and progress to eating solid food. Still drinking food supplement from a bottle, Jack is encouraged to try new tastes and textures by custard, jam and other foods being placed on the one ball he will put to his mouth. 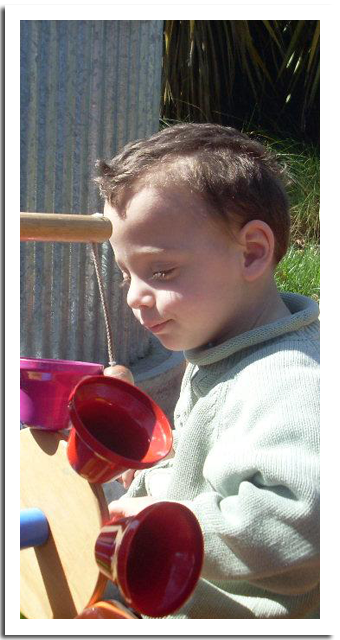 Jack is also encouraged to put his hands into bowls of water, rice and other materials to get him used to the feel of different textures. This is extremely important if Jack is going to be able to tolerate personal care routines more now and into the future as well as engage and interact with his environment. It is also important that Jack has deep pressure massage as he ‘loses himself in space’ - that is he has limited capacity to sense where his body is in space. Jack has a higher tolerance to auditory and visual sensory stimulation and some of his favourite activities involve these. This is encouraged to assist in improving developmental milestones around areas such as hand/eye coordination and language and comprehension. Jack loves sitting in the beanbag that has speakers in it and vibrates with the music. Jack also loves watching the pretend fish in the tall glass cylinder that changes colour when pressing the buttons. For Jack, success is very much small steps. At first Jack just liked to hear June singing “Twinkle, Twinkle little Star’, now he tracks her hand movements with his eyes. Jack has also shown some improvement in his visual recognition skills. When shown a card with a picture of the hammock on it Jack is now reaching for it, linking the picture with the concrete experience of being able to sit in the hammock which he loves to do. Jack does not yet speak but some of his vocalisations have started to sound more like: “Mum”, “Jack” and “Tickles”. Another part of Jack’s program is ‘switching’ which encourages Jack to push down the lids of pop up toys to help develop his hand/eye coordination. There is a red bucket and a blanket swing that enables to Jack to experience high level movement to increase arousal and stimulation in the brain. Jack can crawl, but has been hesitant to walk. June places toys and things of interest on tables and equipment of various heights to encourage Jack to pull himself up and reach for the items, including placing them to the side to encourage him to side step. These activities will help strengthen Jack’s limbs, encourage gross motor movement, increase his confidence and lay the foundations for him to walk. There is also physio ball, and a rocking horse to encourage Jack to weight bear through his hands, knees and feet. By home time at 2.30pm, Jack is usually exhausted and happy.